Half and Half created a whole new different way of making and serving “Boba” and “Boba Drinks.” The way that our Boba is prepared and served is new, fresh, and very different from the traditional ways of serving Boba in tea & drinks. Boba is usually all cooked at once and then served at room temperature or cold throughout the day. Half and Half is best known for originating and first serving Hot Honey Boba; always served hot in your drink and it is always fresh because we continuously make Boba all day. Boba that has not been served within about 3 hours is replaced with freshly cooked Boba. Hot Honey Boba has a rich infused honey flavor and textures that change as you enjoy your drink. The contrast in temperature between the iced drink and the hot Boba, creates a unique experience where you can taste different textures of the Boba as all the elements blend together. Hot Honey Boba can also be enjoyed with any hot drink too. Hot Honey Boba is so innovative that it has never been served this way anywhere in the world, including Taiwan. Hot Honey Boba was first served at Half & Half’s first location in San Gabriel, Ca, USA. It has changed the way all Boba lovers perceive and enjoy Boba today. Tea Houses of the old and new have almost all adopted our Hot Honey Boba as the most popular way to serve Boba. We take pride in freshly preparing our Boba with just the right timing and secret recipe to give it the best possible texture to compliment your drink. We carefully select our Boba, imported from Taiwan, made specifically just for Half & Half and can only be tasted at Half & Half. Iced Milk Drink, a non-caffeinated (no tea) milk-based drink, is an original signature drink of Half and Half Tea House / Tea Express. It is a multi-layered drink, with perfectly blended icy milk on top of delicious drink compliments such as pudding or grass jelly and Hot Honey Boba on the bottom. Iced Milk Drink is unique and never served anywhere in the world before Half and Half’s creation and introduction. Enjoy Iced Milk Drinks in a variety of flavors: caramel, chocolate, strawberry and original flavor (brown sugar). Half and Half combines the best elements from different cultures, eastern and western, to create a new and fusion gourmet drink experience. We offer an extraordinary taste with our twist on some traditional favorites and our own innovative blends. Half and Half carefully crafts each and every drink so our customers can taste the difference and quality to set us apart from the rest. The logo is made up of three Chinese words, “ban, ban, tong,” that represent human characters drawn by creative Chinese calligraphy. A man with a spoon, a women and a pair of chopsticks, a laughing and jumping child with a knife and fork (from left to right). Together these characters represent the mission of Half & Half, to create and offer the best possible drink experience to every man, woman, and child from any background and any culture. Half and Half Tea House & Express places emphasis and focus on people. We believe in the importance of creating a positive environment for everyone, including our customers, employees and the community. Our goal is to create a workplace where employees can have great teamwork and to be courteous, polite and willing to help one another; to be loving and caring to each other, to the customers, to all living creatures, and to nature and the environment. We hope we can promote the message of being earth friendly and people friendly, on top of providing great customer service and drinks! 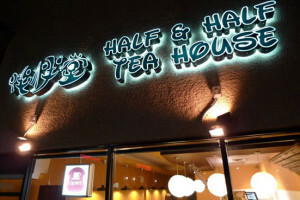 In 2008, the first Half and Half Tea House opened in the San Gabriel, CA. To ensure that we only use the best “Boba drink” ingredients, Half and Half carefully exams, tests, and selects every ingredient we use. Our main ingredients all come from Taiwan, where Boba and Boba Drinks originate. Our primary drink ingredients are exclusive to Half & Half only, and are of the highest quality and standards, never sacrificing anything for lesser substitutes. In a short time, Half and Half‘s drinks, and our signature Iced Milk Drinks and Original Hot Honey Boba became very popular. Soon after, Half and Half trademarked the slogan “The Original Hot Honey Boba and Iced Milk Drinks”® and our distinctive Half & Half logo ®. 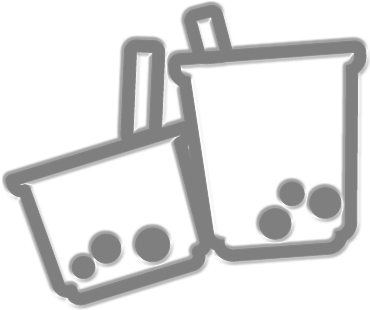 With the constant emergence of competitors, locally and worldwide, who try to imitate Half & Half’s tastes and method of crafting Boba Drinks, Iced Milk Drinks, and Hot Honey Boba, it is of the upmost importance for us to strive for high quality ingredients as well as high standards of quality control. This way our customers can distinctly taste Half & Half’s original flavors vs. imitations. Half and Half has greatly changed and influenced the culture of the traditional Boba & Boba drink industry since its inception. Half and Half Tea House grew rapidly from 2008-2011. As the popularity grew, the volume of demand also grew from customers who always waited in longer and longer lines. Half & Half answered this demand by designing a store that not only made quality drinks, but also made it faster and at an even more affordable price. Taking out the table-service part from the original Half and Half Tea House (San Gabriel) and passing on the savings to our customers. Thus creating what is now known as Half and Half Tea Express ®, a store focused on To-Go drink orders with optional self-seating in Half and Half’s uniquely designed stores. Every store has a theme to its design and look, where all the furniture, fixtures and decorative elements all come together. Half and Half Tea Express ® is the first to use the cute and short “fatty cups” , and its larger and taller version we call the “super cup.” These cups have become so popular that they are popping up all over Los Angeles, California and out of state. Half and Half is about delivering the complete customer experience of great drinks and service in a pleasing environment; from when you first walk into the store and seeing the décor and ordering your drinks, to receiving your drinks and enjoying it on the spot, or taking your order To-Go to later share with friends and family. 2008 Spring, Half and Half Tea House, San Gabriel, CA opened. 2010 Summer, Half and Half Tea Express, Monterey Park, CA opened. 2010 Winter, Half and Half Tea Express, City of Industry, CA opened. 2011 Fall, Half and Half Tea Express, Pasadena, CA opened. 2012 Spring, Half and Half Tea Express, Rowland Hts., CA opened. 2013 Spring, Half and Half Tea Express, Arcadia (Foothill Blvd. ), CA opened. 2014 Summer, Half and Half Tea Express, Arcadia (Baldwin Ave.), CA opened. 2015 Winter, Half and Half Good Old Time, San Gabriel, CA opened. 2018 Spring, Half and Half Boba Express, Alhambra, CA opened. Since 2008, Half & Half has been a trendy landmark in Los Angeles, Ca and a driving force in the Tea House and Boba drink industry. People come, near and far, out of town, out of state and even out of the country to come to Half & Half stores and taste The Original Hot Honey Boba and Iced Milk Drinks ®. Our original creations, Hot Honey Boba and signature Iced Milk Drinks are just two reasons why Half & Half draws new-comers and loyal fans to keep coming back. Half & Half maintains its popularity because we offer the total package of presentation, affordability, continuous innovation of new tastes and unmatched product quality.